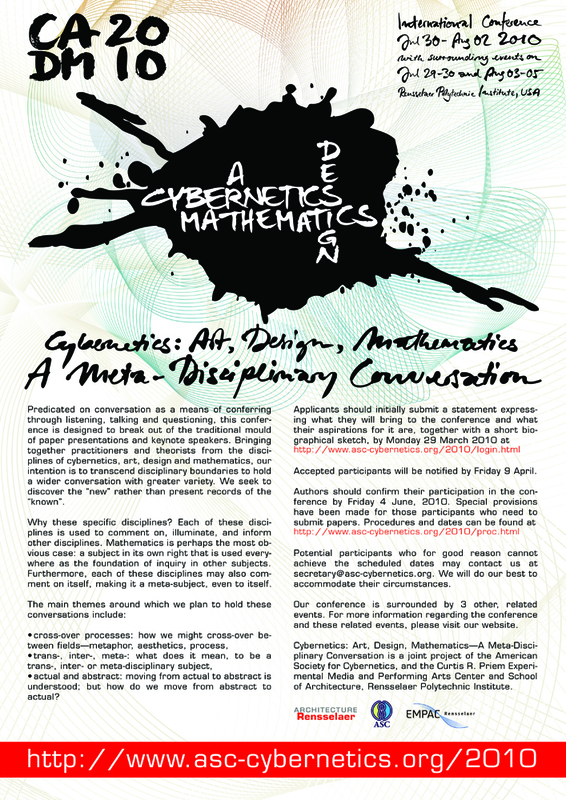 We will be delighted to welcome you as a member of the American Society for Cybernetics. If you would like to join the society before the conference, please click here. Or click on the ASC logo on any page on the website, and navigate the web site to the membership page, which explains the benefits of membership. You will be able to register for the conference at the reduced ASC members rates only if you join the society before you register for the conference. During the conference, registrants who are not ASC member will be able to join the society for an additional fee of $50 ($20 for students). This special offer will not entitle you to attend the conference for the reduced members rate. People in special circumstances may apply for reduced fees, with a statement justifying their request. * Those claiming student status should be full time students in a university or similar, and are asked to bring proof of their status in the form of a valid student card to be charged the reduced student rate for attendance. We do not include as students those with lecturing and other jobs, who are also studying, except under very particular circumstances (ask us).